No better day than today to do something you should've done last October... that's how that saying goes right? Okay so maybe that wasn't exactly it, but let's roll with it! This Monday I had the day off work and decided I would tackle a project I've been meaning to do since I moved into my new apartment last fall: my headboard. I bought the headboard when I bought the bed and frame. The headboard then stayed in the box for months because I never made time to put it together and I didn't love the color. See, the headboard is black and my whole room is filled with white furniture, but I knew that when I bought it... It was just such a good deal that I couldn't pass it up. Then I obviously had the DIY idea (as I usually do). "I'll just make my own upholstered headboard...it'll be easy!" Famous last words? Maybe not, but my intentions were good at least. So there I was, eight months later with a day off and my grandma as a willing volunteer/cheerleader to help me tackle the project. We set off to Joann's and fate set in as all of the home fabrics were 50% off and I had a 30% off coupon for the foam. I left spending only $40 for the fabric, foam, and eight boxes of decorative finishing nails. The headboard itself wasn't completely flat so my grandmother gave me some extra batting to fill the spaces. This allowed the foam to sit even on the headboard. I used duct tape to make sure the batting stayed put before laying the 1/2 inch foam on top. I flipped the fabric upside down on the carpet next and then flipped the headboard on top - foam side down. Then my grandmother helped me staple the fabric in place using her electric staple gun. The hardest part here was folding the corners so that the fabric did not pucker. 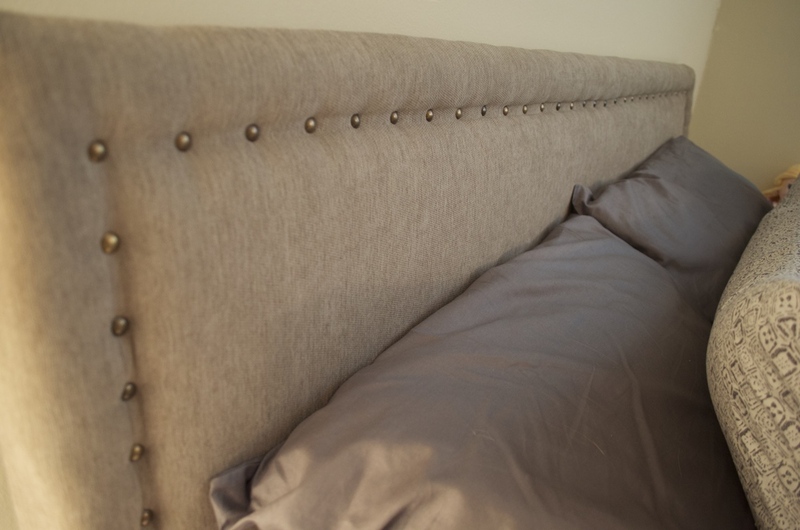 If I were smart, I could have stopped here and called this my easy 30 minute DIY headboard. Unfortunately, I tend to make things more difficult than they need to be. Remember those decorative finishing nails I mentioned earlier? I decided to make a trim for the headboard so that it would look like the super cute ones I see all the time on Pinterest. This decision added a good 3 hours to my project! It started out just fine! I used tape to mark the edge of where the trim would go and used a spacer to make sure the nails were evenly placed apart. The foam was a little bit too thick for the nails I bought so they kept bending. I went through so many nails and was grateful to have bought way more than I needed. Even though my back hurt the next day from bending over hammering in these nails, I am super pleased and proud of the finished product. It makes my room look so much more put together. Also, the headboard is a neutral color so I can change my duvet cover and easily match it if I ever decide to (which I'm sure I will). Please let me know what you think by commenting! Also, I hope to keep this Summer DIY Marathon going strong so send me any projects you think I should try on here or any of my other social media accounts!